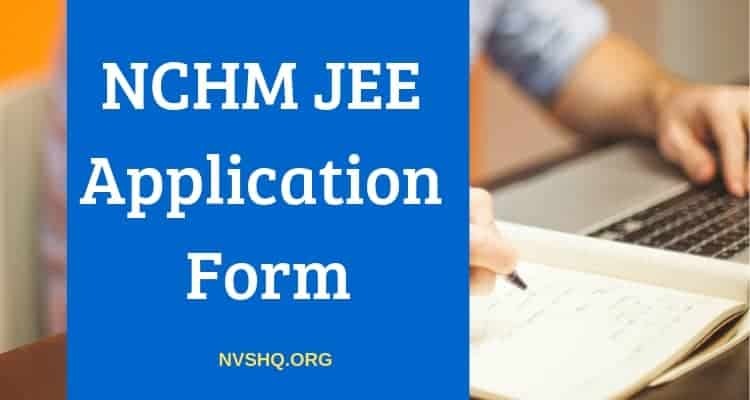 NCHM JEE 2019: NCHM JEE application form for the academic session 2019-2020 has been released. NCHM HEE application forms are currently available and interested candidates can fill the application form before the due date. Application forms have been published online on the official website of the conducting authority therefore interested and eligible candidates can apply from there before 15th March 2019. NCHM-JEE (National Council for Hotel Management Joint Entrance Examination) exam from 2019 onwards is going to be conducted by the National Testing Agency. Earlier it was conducted by National Council of Hotel Management and Catering Technology (NCHMCT). Through this exam, NTA will select suitable candidates for the admission to B.Sc. Course in Hospitality and Hotel Administration (B.Sc.HHA) course in various Hotel Management Colleges across the country. In this article, we have compiled all the necessary information regarding NCHM JEE for candidates. They will find detailed information about the NCHM JEE 2019 application form, important dates, application fee, NCHM JEE eligibility criteria, exam pattern, exam cities, merit, admit card, result etc. NCHM JEE 2019 application forms will be filled only through online mode. Application submitted from any other mode other than the online mode will be accepted in any case. Candidates can fill the application form on the official website of NTA and also from this page. Candidates have to keep all the necessary documents ready with them before filling the application form. Candidates are advised to download and read all the instructions in the admission brochure/ information bulletin. Candidates are advised not to send multiple applications. More than one application will not be accepted in any case. Candidates must fill all the details carefully in the application form as they cannot make correction in the application form after submission. Scanned colored/ black & white clear passport size photograph of size between 10 kb–200 kb in JPG/JPEG format. Scanned signature of size between 4 kb–30 kb in JPG/JPEG format. For filling the application form, candidates are initially required to register themselves. They first have to visit https://ntanchm.nic.in. They have to click on “Apply” link. Read all the instruction and hit “click here to proceed” button. Fill the personal, contact details in the registration form and submit. After successful registration, an application no and password will be generated. Candidates have to keep this no and password safe till the end of admission procedure. Log in with the application no. and password. Fill all the details in the application form carefully. In this stage, candidates have to upload the required documents in the prescribed format. Candidates must ensure that they upload the correct photograph in the specified format as facility for correction will be given to any candidates. Once candidates have filled the application form, they have to make the payment of application. Candidates have to select the payment mode and have to make the desired payment. After the successful payment of application fee, a confirmation page will be generated. The last step is to download and print this confirmation page. Candidates are not required to send the printed copy o fill in application fee to the NTA office. Candidates can make payment of application fee by Payment by Debit/Credit Card/Net Banking/e-Challan. All the applicants have to check the eligibility criteria before applying. They must ensure that they fulfill all the eligibility requirements before filling the application form. Upper age limit for General and OBC category candidates is 25 years as on 1st July 2019. No upper age limit is there. For SC and ST candidates, upper age limit is 28 years. Secondary Education Board/Pre-University Certificate of the candidates will be considered as the proof of age. Candidates should have qualified 10+2 or equivalent from a recognized board. Candidates having General Certificate Education (GCE) Examination (London/Cambridge/Sri Lanka) at the Advanced (A) level is also eligible. Candidates with High School Certificate Examination of the Cambridge University can also eligible. Appearing students are also eligible provided they have to submit the qualification certificate latest by 30th September 2019. They also have to submit a physical fitness certificate issued by the Registered Medical Practitioner. For admission to private colleges/university, candidates have to check the reservation criteria of the respective college. Reservation for Kashmiri Migrants- one seat (Supernumerary) in each Central and State Government affiliated IHM is provided to registered Kashmiri migrant candidates as per the notification of HRD Ministry, Govt. of India for 2019-2020. Admit card will be issued to the registered candidates from 3rd March 2019. After that candidates will be able to download and print the same. They are required to carry the same to the examination center. After the commencement of the exam, NTA will release the recorded responses of the candidates and answer keys. Candidates can check the answer keys on the official website. Candidates not satisfied with the answer keys can challenge the answer keys by filling an application form and making a payment of Rs.1000/- per question. NCHM JEE 2019 result will prepared on the basis of answer keys. The result is expected to release by 15th of May 2019. The result will be final and no request for revaluation or re-totalling will be accepted. After the declaration of result merit list will be released. After the declaration of result, counseling will be conducted for the allotment of seats in various colleges and institutes. Counseling details will be communicated to candidates through official website, SMS and email. NCHM JEE 2019 online application form currently available and interested candidates must fill the form before 15th March 2019. Multiple applications will not be accepted under any circumstances. Candidates must read all the instructions and eligibility requirements before filling the application form. Candidates will be intimated through the website and also through the registered mobile no. and emails. Applicants are suggested to NTA in case they need any help regarding application or admission. Ask your query related to NCHM JEE exam below or if you are facing any problem in filling NCHM JEE application form 2019 online.